FBN’s Ashley Webster breaks down the March retail sales and producer prices data. 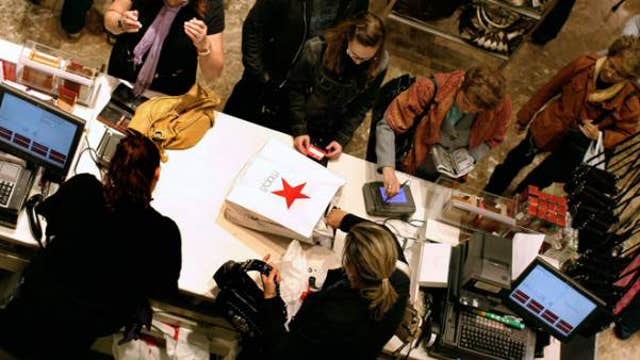 U.S. retail sales rose in March for the first time since late last year as consumers stepped up purchases of automobiles and other goods, suggesting a sharp slowdown in economic growth in the first quarter was temporary. The Commerce Department&apos;s fairly sturdy report on Tuesday together with other data showing producer inflation crept up last month should keep the Federal Reserve on track to start raising interest rates later this year. "A rebound in retail sales in March provides evidence that the U.S. economy is pulling out of a soft patch seen at the start of the year. The improvement in retail sales after the weakness seen at the turn of the year adds to the likelihood of policymakers voting to hike rates this year," said Chris Williamson, chief economist at Markit in London. Retail sales increased 0.9 percent in March. That was the largest gain since March last year and snapped three straight months of declines that had been blamed on harsh winter weather. U.S. stock index futures fell after the data, while prices for U.S. government debt rose. The dollar was weaker against a basket of currencies. Retail sales excluding automobiles, gasoline, building materials and food services rose 0.3 percent after dropping 0.2 percent in February. The so-called core retail sales correspond most closely with the consumer spending component of gross domestic product. Last month&apos;s jump in overall retail sales should ease fears of sustained weakness in the economy after an unusually snowy winter undercut activity early in the year. Labor disruptions at normally busy West Coast ports, a stronger dollar and softer global demand also have constrained growth. Data on trade, consumer spending, manufacturing and home building have suggested the economy grew at a sub-1.5 percent annual rate in the first quarter. In a separate report, the Labor Department said its producer price index for final demand increased 0.2 percent last month, with rising prices for goods accounting for more than half of the increase. The PPI had declined 0.5 percent in February. Low inflation and signs of a sharp slowdown in economic growth in the first quarter have prompted most economists to push back their expectations for the first Fed rate hike to either September or October from June. Others believe the U.S. central bank will only tighten monetary policy in 2016. A key measure of underlying producer price pressures that excludes food, energy and trade services rose 0.2 percent after being unchanged in February. Core PPI was up 0.8 percent in the 12 months through March. Retail sales last month were buoyed by a 2.7 percent rise in automobile sales, the biggest increase since March 2014. Sales at clothing stores increased 1.2 percent. Receipts at building material and garden equipment stores advanced 2.1 percent, the largest rise since July 2013. Sales at restaurants and bars were up 0.7 percent.